This Hard Maths Riddle is for middle school going teens. Solving this hard Maths Riddle will help you to test your Mathematical skills. Your challenge is to find the next number in the given Maths Series. Can you find the next numbers in the series? 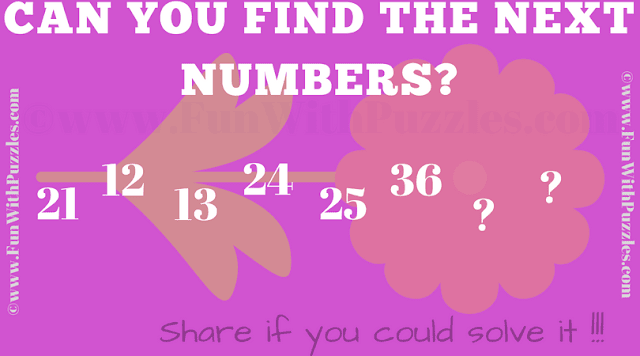 Can you find the next number in this series? Answer of this "Hard Maths Riddle to Solve for Teens", can be viewed by clicking on answer button. Please do give your best try before looking at the answer. The Answer is 37 and 48. If AB CD are the series numbers in the same order, then D=B+1 and C is absolute difference of A and B.